For this option, you must apply to our program in order to receive an installation quote. You will not receive a quote over the phone. Details about your home are required in order to properly assess each customer’s unique situation. Step 1 - Does your home qualify? Live within our current service areas. Have a credit card. Right now our program only accepts either VISA or MasterCard. NOTE: New service areas will be added as the program expands. If you currently live in an area where we don’t provide this service, please come back and visit our website to check for updates. If your home qualifies for our program, complete the application. It will take you approximately 20 to 25 minutes to complete. Q. Why does it take 20-25 minutes to complete the application? ♦ complete the on-site evaluation of your home and installation based on the information you provide and confirm it when he/she arrives. Want to save time? Visit this page for a checklist of the things you can gather together before starting the application. IMPORTANT: Please look at your electrical panel. If you don’t already have an available 40 amp breaker (which will be used for the charger), one will need to be installed. In order to do that, there must be two empty “slots” which are side-by-side in order for the electrician to install a 40 amp breaker. If you don’t have space on your panel for this, then we can not install the breaker nor the charger. If you have empty spaces but are not side by side, or you are not using existing breakers that can be replaced for a 40 Amps breaker, then there will be additional costs for the reorganization of the panel breakers in order to make room for the 40 amp breaker. Please make sure you read all of our Program Policies and FAQs to make sure you understand how our program works. Once your application is complete, and you click submit, you will see the confirmation below. Click on the DOWNLOAD APPLICATION button and save (or print) a copy of it, and have it available when the electrician arrives. If there are any changes to your price quote, the electrician will explain the differences between what was quoted (based on your application) and their “in-person” assessment of your installation. As noted on our home page, you must apply to our program in order to receive a quote. 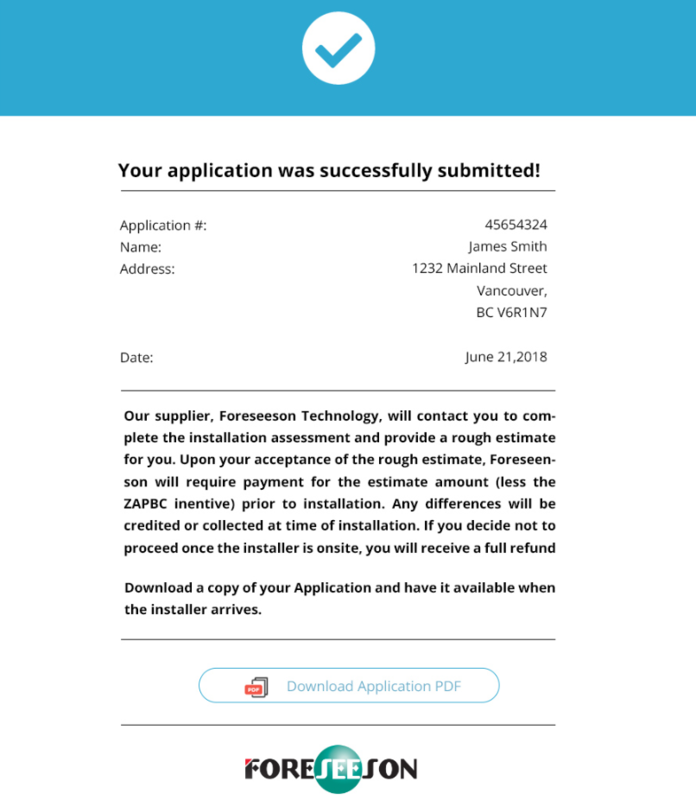 Once you apply, a Foreseeson Technology, Inc. representative will contact you within 3 business days of your application date to review the details and to provide you with a rough estimate for the installation cost. You get the ChargePoint Level 2 charger for free, but you must pay applicable sales taxes on it. The total cost (charger & rough estimate) will have the $1,100 ZAPBC incentive deducted from the total, after taxes. The quote is considered a “rough estimate” because we cannot give you a final price until the electrician visits your home, completes a site assessment with you, and confirms the details you provided in your application. Please reference the FINANCIAL section of our Program Policies or the FINANCIAL section of our FAQs more details. * Installation costs vary, depending on your home, location of the electrial panel and many other things. Average installation costs range from $600 to $1,400 dollars, however some homes may be more and some (plug-in model) may be less. If you accept the rough estimate, you will be asked to pre-pay the installations costs* (VISA or MasterCard only). Then Foreseeson will dispatch the electrician who will contact you within 3 business days to arrange your installation date. Installations will typically be completed within 20 days of the date the electrician contacts you (subject to how quickly your municipality issues the electrical permit to the electrician). For details about rough estimates or pre-payments, please review the FINANCIAL section of our Program Policies page. *Your rough estimate quote will always have the $1,100 incentive amount deducted from the total installation cost. Before the electrician arrives at your home to install your new charger, you will need to create your free ChargePoint account. Click here to visit the ChargePoint website page that provides all the details related to activating an account. Please review the EV CONNECTION & DATA section of our Program Policies page for details. ZAPBC is a privately funded program and is a part of the SCRAP-IT family of environmental programs.